Friday 7th December 2018 in Zoner BOBYHALL happened what we all have been waiting for - we found out who became winners of already 15th season of beauty contest Miss & Mr. Look Bella 2018. We have opened the ball season in Brno - Gala Ball Brno 2018 and festive final evening of contest Miss & Mr. Look Bella 2018 took place on the first December Friday in Zoner BOBYHALL. The hosts of the magical evening were duo – beautiful actress and singer Kateřina Brožová and charming actor Miroslav Šimůnek. The star of the evening was talented and popular singer Mikolas Josef, who sang also during the fashion show of designers duo Poner Poner, we enjoyed also gospel songs from choir group Skyey Gospel with lead singer Leona Gyöngyösi and for dance played members of B-Side Band. The pleasant surprise of the evening was managed by Nela Slováková, who walked the catwalk in swimsuit and ensured unexpected moment of the evening. To the wealthy programme was accompanied also by catering and luxury served 3-course menu. Anniversary XVth season of MISS & MR. LOOK BELLA 2018 is now in the past. Same as every year, also this years evening was thanks to je nyní již minulosti. Stejně jako každý rok, nám pořádající agentura Prestige Models zajistila jedinečný večer plný krásy, celebrit a zábavy. Nezapomenutelný byl večer především pro našich 12 finalistek a 6 finalistů, kteří bojovali o nejeden titul. Beautiful ladies and likabel young men presented themselves during fashion show in beautiful dresses and jacquettes. Luxury dresses from fashion designers duo Poner underlined the beauty of our finalists and elegance of our male finalists was highlighted by smoking from saloon Ceremoni. Ladies also walked dresses from wedding saloong of Dana Svozílková and saloon Delta. The swimsuit promenade could not be missing. Finalists walked the catwalk in colourful swimsuits Neonky by Nela Slovakova and also in luxury lingerie Werso and Simi Secret. The makeup of finalists was done by make-up artists from Marionnaud and hair styling was taken cary by professionals from Tomas Arsov Hair & Beauty Institute. In the jury could not be missing of course this year´s patrons topmodels and winner of Look Bella 2010 and 2012 Veronika Krajplová and Antonín Beránek and last year´s winners Kristýna Stanislavová and Jaroslav Machálek, fashion designers duo PONER, official photograph of the contest Arthur Koff, model and businesswoman Nela Slováková, and lots of others. The head of the jury was the director of the contest and of the producing agency Prestige Models Martin Špaček and executive director of the agency Ondřej Špaček, who decided about the winners together with other jurys from our respected partners. Beautiful Terezie Jastrzembská and charming Artur Ország are winners of jubilee XV. Vol of beauty contest Miss & Mr. LOOK BELLA 2018! 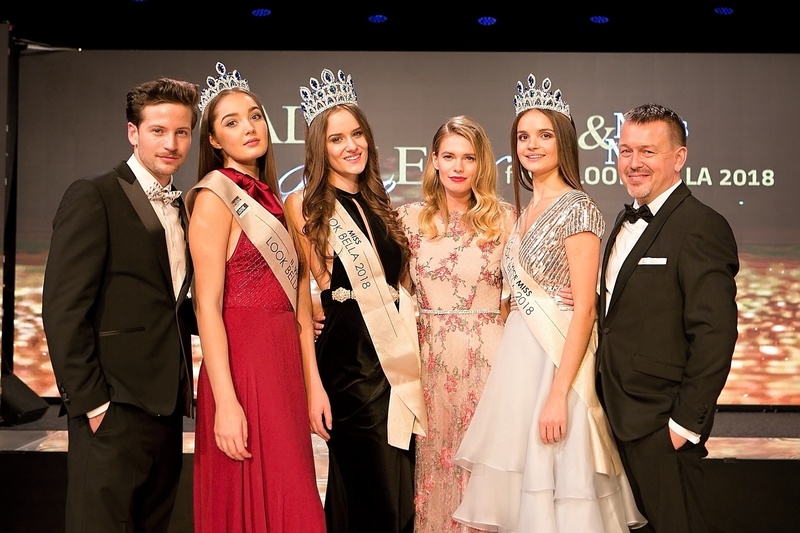 The absolute winners of Miss & Mr. LOOK BELLA 2018 are Miss LOOK BELLA 2018 - Terezie Jastrzembská and Mister LOOK BELLA 2018 - Artur Ország. Winners received specially designed crowns from Roman Matouš Jewelry and Bijoux and also received gifts in total amount more than half million Czech crowns. During the evening the top three ladies and young men were titled. Titled was also lady with the most beautiful silhouette Miss Look Bella Silhouette 2018, the one who will represent Czech rep. on the abroad beauty contest Miss Look Bella World 2018, winners of internet voting Miss a Mr. Look Bella Internet 2018 and titles were awarded also by the partner of the contest – company Elan Skis. Mister LOOK BELLA 2018 - Artur Ország - No. 2. I. vicemister LOOK BELLA 2018 - Martin Voldán - No. 3. II. vicemister LOOK BELLA 2018 - Patrik Hoffmann - No. 5. Miss LOOK BELLA 2018 - Terezie Jastrzembská - No. 8. I. vicemiss LOOK BELLA 2018 - Anna Kosová - No. 7. II. vicemiss LOOK BELLA 2018 - Denisa Korešová - No. 10. MISS World LOOK BELLA 2018 - Dominika Trelová - No. 9. Miss Internet LOOK BELLA 2018 - Nikola Tomášková - No. 1. Mister Internet LOOK BELLA 2018 - Patrik Hoffmann - No. 5. Miss Silhouette LOOK BELLA 2018 - Lucie Svobodová - No. 12. Miss Elan LOOK BELLA 2018 - Denisa Grossmannová - No. 4. Mister Elan LOOK BELLA 2018 - Zdeněk Dvořák - No. 1.